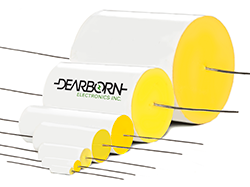 February 15, 2018 - Now available through New Yorker Electronics, the new Exxelia Dearborn 880P Series of metalized Polyphenylene Sulfide (PPS) Film Capacitors is designed to keep cool when things get hot. With an operating temperature range of -55°C to +150°C, they experience no derating for DC operations and none in AC operations up to +125°C. This enables them to function at full capacity in extreme heat applications. The ability to operate at such high temperatures can eliminate the need for a cooling system within the design, thus reducing overall design time, weight and space. PPS is a high-temperature, low-loss dielectric film used in the 880P Series of wrap-and-fill capacitors. This allows them to feature superior electrical characteristics over an extremely wide temperature range and maintain excellent capacitance stability in one rugged, lightweight package. It performs consistently well in commercial applications such as in power supplies and in more demanding applications, such as in avionics, on a congested control or instrumentation panel. The series features a capacitance range of 0.0047µF to 10.0µF and voltage ratings from 50 to 400VDC with precision tolerances as low as ±¼% through ±10% yielding greater accuracy of capacitance. It is also a customizable unit with voltage maximums of 700 – 800VDC at 125°C maximum (higher voltages are available at reduced capacitance). Made in the USA, the units are highly durable and capable of withstanding a five-pound pull force on lead axis. They are non-polar and demonstrate low loss factor, good voltage breakdown strength and high insulation resistance (low leak current) -- and are completely stable over normal temperatures, voltages and frequency ranges. These characteristics allow the 880P Series capacitors to deliver high performance in a variety of applications such as DC timing circuits, low- to high-frequency AC applications, and pulse or energy discharge uses. Additionally, the package has axial leads with moisture-resistant, flame-retardant epoxy end seals and an outer tape covering for maximum performance. New Yorker Electronics can supply the units on tape-and-reel for use with automatic insertion equipment; custom designs and non-standard values are available. New Yorker Electronics is a franchise distributor of Exxelia Dearborn and carries its full line of Film, Mica, Tantalum, Aluminum Electrolytics and Ceramic Capacitors as well as its EMI/RFI Filters, Magnetics, Position Sensors, Slip Rings and Rotary Joints.